A few months ago, I visited Luang Prabang, a Unesco World Heritage site. It's a small town with beautiful streets, houses and temples. Stuck in between the Mekong and the Nam Ou rivers with terraces by the water, it's a great place to spend a few days (we kept on extending our stay there). Besides strolling around visiting the temples, the main attraction is to get up at five and watch the monks make their alms round. It's truly impressive to see rows of orange robes passing by, bald monks carrying their silver boxes for the rice they are given. Unfortunately however the many tourists are ruining this ritual. Some of them (probably not Buddhists) also sat on a mat to hand out sticky rice to the monks (being unexperienced they were slower than the locals, which led to queues of monks behind them). This tourist participation has led to a rather fierce sticky rice sale in front of the guesthouses. 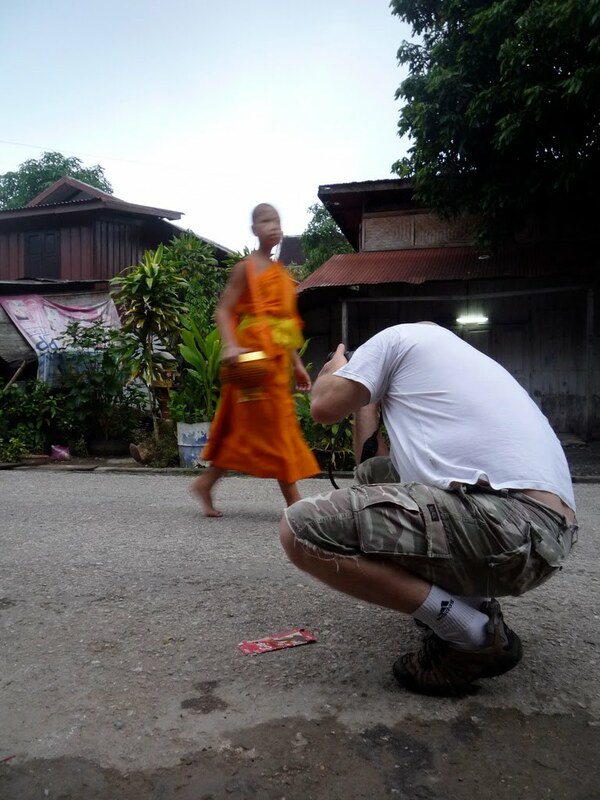 But worse are the tourists that 'forget' to pay respect to the monks. They stand tall in front of the monks (while you're supposed not stick out taller than them) and aggressively close in on the monks flashing their cameras in their faces. This was one of things signs all over town asked us not to do... It seemed the poor monks had walked into a tourist trap. A quiet backstreet was better, until one tourist decided to flash tens of monks in the face.